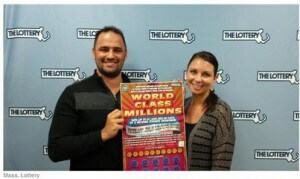 Michael Milford of Melrose won the second $15 million prize in the Massachusetts Lottery’s $30 World Class Millions instant ticket game. Milford and his fiancee Allison Gilgun received their prize as a one-time payment of $9,750,000 less taxes. It is the largest scratch and win prize awarded in the state. The happy couple, who have been planning a Dominican Republic wedding for several months. Now they have all the money they need for the wedding, pay off all their bill, and help their family; they’ll even have enough left over to invest for their future. The Boyles Family Market in Medford will receive a $50,000 bonus for selling the winning ticket. Two more $15 million prizes remain in play.